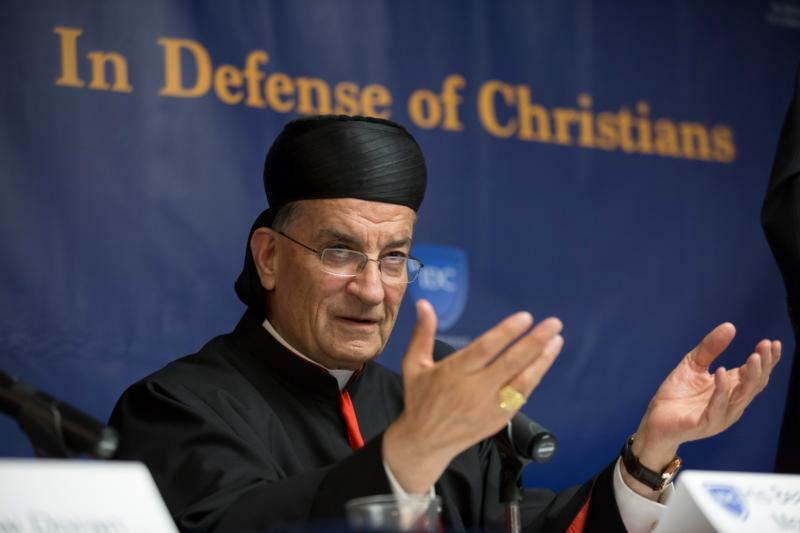 “You are a vital part of our Maronite Church, and through your hard work and effort you will continue to accomplish great things and keep our Maronite faith, traditions and culture alive for future generations in this part of the land,” said Lebanese Cardinal Bechara Rai. He made the remarks at a reception after he celebrated the Divine Liturgy at St. Vincent de Paul Church in Salt Lake City. Concelebrants included Bishop Oscar A. Solis of Salt Lake City; Archbishop Paul Nabil Sayah, patriarchal vicar general for foreign affairs, who was accompanying the cardinal; Bishop A. Elias Zaidan of the Eparchy of Our Lady of Lebanon of Los Angeles; Msgr. Joubran BouMerhi and Chorbishop William J. Leser, pastor and former administrator, respectively, of St. Jude Maronite Catholic Parish in Murray; and numerous priests of the statewide Utah diocese. Cardinal Rai’s Oct. 20 visit to Utah was part of a U.S. trip that included various stops at Maronite parishes and his participation in the 2017 In Defense of Christians Summit in Washington Oct. 24-26. On Oct. 28, the cardinal was to join New York Cardinal Timothy M. Dolan in blessing and dedicating the chapel of St. Sharbel, a Maronite saint, at St. Patrick’s Cathedral. In his homily during the Divine Liturgy, the cardinal discussed the parable of the growing seed in the day’s reading from St. Mark’s Gospel. He compared the parable to the growth of the kingdom of God. Catholics receive the grace of God at baptism, but “it is our responsibility to cultivate the ground in order for the seed to grow, prosper and bear fruit,” he said. “We are called to nurture the grace we have received by prayer, reading of the Scriptures, practicing the virtues and living life that is worthy of the calling that we received,” Cardinal Rai continued. He also called on all present to renew their faith in God and their commitment to the Catholic Church. The cardinal’s time in Utah included a stop at the diocesan pastoral center to visit with members of the Salt Lake Interfaith Roundtable’s executive board. He answered a few questions about conditions of Christians in Lebanon. He also spoke about how the country is handling the influx of refugees who are fleeing the violence in neighboring Syria. The refugee population in Lebanon is about 2 million, almost half that of the native population. Attempting to provide for the refugees strains the country’s political, economic and social services infrastructures, Cardinal Rai said. The rabbi told the Intermountain Catholic, Salt Lake City’s diocesan newspaper, that she knows the Middle Eastern perspectives about Israel very well, but the Christian Lebanese perspective is different, she said. Bishop Solis called the cardinal’s visit to Utah and other parts of the United States a blessing not only for the Maronite community but for Catholics. “His Eminence came here as a shepherd, reaching out and tending the sheep entrusted to his pastoral care,” the bishop said. “He mentioned that 50 percent of the population of Lebanon is scattered in many countries all over the world. “It is inspiring to see the patriarch taking the time to meet and get to know the Maronite communities all over, and to be able to bring to them the good news of God’s love and salvation,” he added. Mischel is editor of the Intermountain Catholic, newspaper of the Diocese of Salt Lake City.